Today’s since, today’s Mother’s Day, I would like to meditate on their love and sacrifice for us. Apostle Paul once said this by the grace of God, I am what I am. This is his confession that there’s no part, no experience in his life that is without God’s intervention and grace. In other words, the ownership of his life does not belong to him and God is the source of his existence and his life. As we are celebrating Mother’s Day today. The relationship between the parents and their children has the same meaning and implications. As children, we are what we are by our parents, grace, the fact that we were born and raised in this particular way and that everything we are enjoying this life, uh, due to our parents love and sacrifice. There’s an expression in Korean. For those who know Korean, the word is called “baeum mandokk”. That Korean letter is called “baeum mandokk”. It is one word but actually has four different Chinese characters. And each character has his own meaning. Bae. The first letter means betrayal or neglect. The second letter means grace. The third letter means you forget that we forget something about, and the fourth letter is almost like the grace of virtue, something very, a kindness and goodness. What this means is the one who has received so much grace from others, but he or she forgot about it to totally. So the word describes such condition of ungratefulness. Last week I flew to Washington DC on Tuesday night and flew back to Toronto on Wednesday night due to my personal matter, the uncle who used to live in DC for a long time, they moved to the states in 1975. He had passed away recently and his children to whom I’m a cousin asked me to come and lead the funeral service for their father. The uncle was the first child of eight siblings and most of his younger sisters brothers live in the states. So my cousins will have a few people from his father’s side. They were fathers side but not many from their mother’s side, which is me and my sister. So on Sunday night, I purchased a round-trip flight and I flew to DC on Tuesday evening and let the funeral service on Wednesday morning and burial site service and reception, lunch, reception and so on, and flew back home on Wednesday evening. As I reflected, within 24 hours, so many things happened and I reflected on this trip, I was able to realize that the whole trip and the whole funeral services will be done by God’s grace, by God’s grace, I am who I am and by God’s grace. By God’s grace, I was able to lead the funeral service in a meaningful way. I realized that what I’ve learned any experience from this church that really has become my foundation, being able to lead the service in both languages and this is something I would never imagine when I first come to this church a few years ago. Being able to communicate with the funeral director with regard to the whole schedule and to be able to guide her step by step, was done by God’s grace through the experiences from this church. There have been a few in my past who offered a prayer for me, who provided encouragement for me and if who guided me with their wisdom, I’m humbly recognizing that how much I am indebted to this faith community. Jesus said this in today’s texts, very truly, I tell you, unless a kernel of wheat falls to the ground and dies, it remains only a single seed, but if it dies, it produces many seeds. These are the words Jesus spoke to his disciples as he foresaw the cross in his mind, the fact that our kernel must die so that it will produce many seeds, signifies the death and resurrection of the Cross, the sacrifice of one person. Jesus will bring life for many, and when Jesus said this, he, he said, he began his words by saying very true and in the original language which is in Greek, very truly is simple. Amen. Amen. Amen is a Greek word and Hebrew word, the same word, and NRSV translates that as very truly Jesus is about to say something very important. He truly needs it. Listen up, guys. I have to say this. You need to remember what I’m going to say. As a matter of fact, the verse 23, which is the very right, the verse right before today’s text indicates such a moment has just arrived. 23 goes, Jesus replied, the hour has come for the son of man to be glorified. As you know, according to the gospel of John, this hour thing is so crucial to understanding the ministry of Jesus. Until now, Jesus kept saying to people, my hour has not come yet. Remember the story of Canaan wedding at Canaan Kinda know Canaan. Yeah, wedding at Canaan. Everybody’s asking, show us. Reveal yourself, but Jesus said the hour has not come yet, but now Jesus is saying such hour has come and because of this I’m going to talk about the cross that has both death and resurrection. Because of Jesus’ sacrifice, many will gain eternal life and many will live an abundant life, and my friends, such a spiritual principle applies to other areas of our lives. As a matter of fact, nothing in this world will be done without summons, love and sacrifice. Whatever we are enjoying in this life was the result of summons, sacrifice, prayers, and tears for us, so let us not take anything for granted. A concrete example is that we cannot think of our parents love and their sacrifice for us because of our parent’s sacrifice. We are who we are. As we have so many newborns in our community. When a couple gets married and when they have their own babies, they will become more appreciative of their own parents love and how much they had to sacrifice for them. You know certain things in life. Only when you actually go there and experience it, you, you’ll know better. I, myself is not immune to this. As I have children myself, I came to realize how much my parents had to sacrifice for me. I gradually, but surely understand my parents, especially my mother’s sacrifice and love more and more now these days. My mother is 80 years old and she became a widow 46 years ago. That means I’m not younger than 46. Right? And I realized that as she grew old, her love grew deeper too. I’m not sure whether I did not recognize that, but these days I recognize that my mother, her love became deeper and genuine and that is the phenomenon I observed from our KSM congregation too. Some of them I have known for many, many years, like 16 years as they grew old, I realize they are love and personality grew deeper and deeper. I think it is because the day they will meet their creator again is approaching. I think It is because they feel that life on earth has not really left much. When I think about my mother, she tried to live as a person of faith and love in a general sense got deeper out of her concern for me, I get to hear quite often from her saying, don’t worry about me. I’m okay. Go back to church. Whenever I make a phone call asking if there’s anything I can buy for her or if she needs anything, she would not want to take much time from me from my busy life. She saying I’m okay. Two years ago, before I went to South Africa, she told me, when you are having a hard time in South Africa, do not think about anything else, but think about how much sacrifice Jesus made for you and how much suffering Jesus had to go through that actually helped me to sustain my focus and to be able to overcome many difficulties and later I realized that my mother herself went through what she told me by living by herself for many years, by taking everything to the Lord every day, dying with Christ and living with Christ. We are all indebted to love each other, to our parents, to our siblings, to our church members, and to others. We all love. When you are young, relatively younger than me and young. It doesn’t come to you when you, when you pass 50, 55 like Edward, you have this sense of appreciation more how beautiful life is. It is too short to just waste away. We need to pour out our love, genuinely treat each other, pray for each other. It is such a short life. We realized that when we realize this condition we are in, we will be able to reach out to others with genuine love and care. When even a kernel of wheat falls and dies in God, God will make it grow and make it bear much fruit. Amen. Let our love and care go through the cross. Let us embrace the cross. When we do everything tight, die with Christ, live with Christ. Whether we are serving where we are caring for each other. Where we are practicing whatever we do, let us embrace the cross every for everything, every moment. God will make our life bear much fruit. If a person who can realize that he or she is the fruit of the parents, love, and sacrifice, I believe that he or she has succeeded in life. I’m not like I’m making a lot of money but having that kind of understanding, appreciation, insight about the life that is such a blessing and that person will love, will be able to love others genuinely. When I got back from Washington, D, C and reported about the funeral to my other uncles in Korea, they said thank you to me quite often. It was a strange feeling. I thought to myself, they didn’t really have to say thank you to me, but I understand why they said that to me. Our parents’ age would appreciate even a very small thing from us. They would be thrilled to see hearing, hearing such things from us. I thank God for our parents who allowed us to know, to taste, to feel the love of God through their love for us. 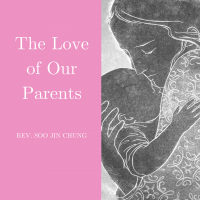 God’s love becomes concrete tangible to us through our parents. Love. Today’s Inner Voice echoed the same thoughts. So I want to share with you some of them. Mother’s love is the best example that shows us what love is. When we see mothers love, we see the true face of love. She bears everything for us, always believed that we will do well, always hopes for us and endures all things for us. We are here today because of our mother’s love. Let us thank them today for their sacrificial love and let us live with deep gratitude for teaching us the beauty of love. Love comes down to us from God, from top to bottom, from one generation to another generation. As much as we receive it from our parents. Let us overflow it to our children. Our children will remember and keep the love for a long time and they will bear much fruit in their life. I remember the text Reverend KIM preached for KSM last Sunday. He quoted from Isaiah, Isaiah 55 and verse 10. It says, as the rain and the snow come down from heaven and do not return to it without watering the earth and making it bud and flourish so that it yields seed for the sower and bread for the eater. The love from God will not go to waste. It will enrich our lives and it will bear fruit. For many, I thank God for our parents one more time because of their love and sacrifice. We are who we are. Happy Mother’s Day.